A real-life war story is uncomfortably split in Hacksaw Ridge. There's no need to introduce the kind of vaguely offensive martial metaphors used by athletes: Actual war is hell, while making a war movie is merely a unique kind of artistic challenge. Some of the most celebrated movies in history have addressed the experience of war—from All Quiet on the Western Front to Apocalypse Now to Saving Private Ryan—in a way that keeps raising the bar. Are there compelling new stories to tell about the brutality of armies clashing? And are there ways to tell those stories that don't feel like something we've already seen in a much better version? Hacksaw Ridge certainly achieves the former, uncovering a fascinating World War II-era footnote that brings a new perspective to a familiar milieu. But the way director Mel Gibson and screenwriters Andrew Knight and Robert Schenkkan choose to tell that story evokes one of the most distinctive war movies ever made: Stanley Kubrick's Full Metal Jacket. And the comparison does not work in Hacksaw Ridge's favor. 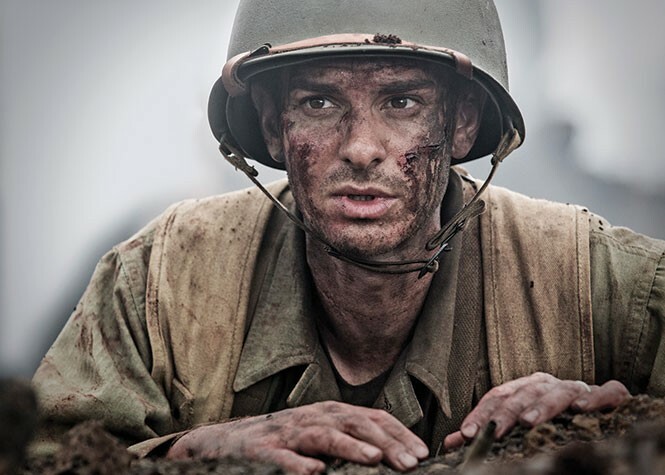 The story concerns Desmond Doss (Andrew Garfield), an earnest young man living in Virginia's Blue Ridge Mountains as America goes to war in 1941. He's determined to do his duty in service to his country, but faces a unique challenge: As a devout Seventh-day Adventist, he is adamant in his refusal to take up arms against another human being. So as he leaves behind his parents (Hugo Weaving and Rachel Griffiths) and fiancée Dorothy (Teresa Palmer). With the intention of serving as a medic, he believes he can serve by saving lives rather than taking them—until he reaches basic training, and faces a U.S. Army that has no idea what to do with this guy. The Virginia-set early scenes mix an almost aggressive corniness—particularly Desmond's aw-shucks wooing of Dorothy—with an edgy attention to the post-traumatic stress that turned Desmond's World War I veteran dad into a violent alcoholic. Garfield has his strengths as an actor, and one of them has always been his ability to make his characters' fundamental decency not seem tedious. Though it takes perhaps too long for Hacksaw Ridge to finally get to the wartime meat of this story, it sets the stage for Desmond's principles with care and respect. Then Desmond heads to basic training, and things get strangely familiar. In the barracks of his rifle company, no-nonsense Drill Sgt. Howell (Vince Vaughn), moves from soldier to soldier, doling out insults and colorful nicknames to his new charges. As Desmond's uncompromising refusal to pick up a weapon becomes clear, Sgt. Howell not-so-subtly suggests that the other soldiers should adjust the troublemaker's thinking, which they do by beating him. The narrative eventually focuses on Desmond facing a court-martial for refusing to obey orders, and his strenuous wrestling with his conscience, but for too long, it feels like a weak approximation of Full Metal Jacket's Paris Island first half—and while Vaughn's role eventually takes on additional layers, he's no R. Lee Ermey. And, also like Full Metal Jacket, Hacksaw Ridge makes a shift to the battlefield, where it faces a different set of comparisons. In an extended sequence centered around the U.S. Army's 1945 assault on a well-defended high point on Okinawa, Gibson goes for the throat in portraying bodies torn apart by gunfire and explosions. There's more than a little bit of Saving Private Ryan's Omaha Beach sequence in those moments, which doesn't necessarily make them any less effective in capturing the arbitrary suddenness of death, or at showing the horror facing a man like Desmond whose only goal was helping keep other men alive. But where the focus should be on Desmond's heroic risk of his own life to lower dozens of men to safety, Hacksaw Ridge spends too much time on stuff that merely reminds you of another, better movie. It's not as though Gibson isn't a gifted enough filmmaker to give his visceral style some distinctive elements, or the story of Desmond Doss isn't singular enough in its improbable courage to warrant attention. But on a cinematic level, modern war movies need to do more than remind us that war is hell in ever-more-hellish ways, seasoned with foxhole interludes of personal reflection. The unique elements of this real-life tale deserve better than being dropped into a template for movies you've already seen.